Nokia 3310 launched earlier this year, has recently been unveiled in a new revamped version of 'Putin-Trump Summit' edition to commemorate the meeting between the President of the USA and Russia at G20 international forum in Germany. The sparkling new device on offer from Russian phone customizer Caviar costs around $2,468 (approx. Rs. 1.6 lakhs). 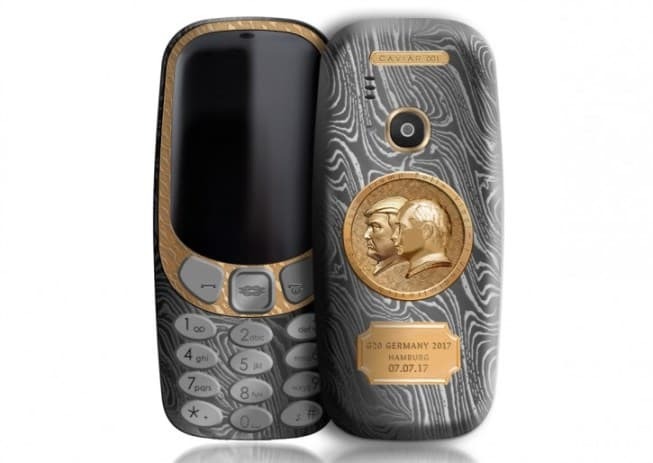 The collector's model of the Nokia 3310 features the portraits of the leaders of the two countries in gold plaque. It also sports a case of hardened titanium of VT-23 grade with a pattern of ‘Damascus steel.’ Much thought seems to have gone in the design of the device as Caviar quotes that the emblem shows both Donald Trump and Putin looking in the same direction, indicating the common desire for progress in Russian-American relations; while the Damascus steel represents the protection of justice. The device boasts an emblem of the G20 summit below the portraits along with the date and venue of the event. This special edition ships in a luxurious leather wrapped case lined with black velvet. Russian company Caviar is known for its special edition phones and has produced in the past devices (usually iPhones) adorned with the portrait of Russian President Vladimir Putin.